When it comes to my fashion style, I am all about minimalism. This minimal concept also applies to my travel style. Believe it or not, I like to pack light, efficiently, and smart. When choosing a luggage to take on my recent three week vacation, I wanted a carry-on that was stylish (obviously), minimal in design, lightweight, yet also durable and functional. Away Travel was literally the answer to my luggage needs. The sleek, polycarbonate, hardshell exterior makes a fashion statement as I strut my way through the airport. I say “strut,” because the double-wheel spinners roll so smoothly so I don’t need to struggle or readjust as I have with other luggage in the past. The carry-on complies with most airline regulations, and I have to admit when I first started placing my clothes in it, I was doubtful it would hold much. I was beyond thrilled when I saw that it had a compression system at the top of the luggage which made it even more roomy to pile on the clothes. Not only was I able to fit two pairs of shoes inside, I was also able to pack five pair of sunglasses without having to worry about them being squished in the luggage since the hard exterior protects everything inside. Aside from the chic design (which is sadly one of the main reasons why I went with Away Travel), one other major feature that I love is the built-in battery that my phone was pretty much attached to all trip long. Not only can I charge my phone with this luggage, I can also connect my laptop (yes, there are two USB ports). Ingenious! Away Travel has really come up with something fabulous when designing luggage. I love their tagline “First class luggage at a coach price” because it truly compares to luxury luggage but literally at a fraction of the cost. If you haven’t checked them out already, you definitely need this for your next vacation! Ideally I only wanted a carry-on luggage, but after traveling with Away Travel through three countries in three weeks, I am convinced that I need the entire Away luggage set including The Medium and The Large for my next adventure. Isn’t that the coolest thing? Now you never have to go looking for an outlet at the airport! What an amazing looking bag! I was actually looking to purchase a new cute carry on bag since mine is so old and I just loveeee the build in battery idea. Will definitely check it out! Thank you so much for sharing babe! new modern case are so awesome and smart! Awww next time for sure! You definitely need this luggage and it comes in so many colors. Have a great trip to Bali, it’ll be amazing! Yes, I took it to Asia (Japan and Korea) and to Hawaii and it still looks brand new! This luggage is so cute! I love the minimal vibes too! And omg a usb charger? Can life get any better? I definitely need to look into this case because not only is it sleek, it’s efficient! People are coming out with such cool designs with tech lately! Have you seen the luggage that you can sit on and ride like a scooter? This luggage sounds amazing! I am definitely looking into this one because I plan on traveling more! Hi Rach, yes you have to look into it. It is seriously so much cheaper than the luxury brand luggages, but I think it totally compares in quality! Um, okay you have totally convinced me that I need this luggage. I’ve had the same suitcase since I was a teen and it’s gotten some pretty intense wear and tear. It’s also the stereotypical black, clunky suitcase that looks like *everyone* else’s! This suitcase, while black, is sleek and sets itself apart from the rest, PLUS it has so many amazing features. Definitely a must-have for any traveler! Thanks for sharing! Yes you NEED this luggage and it comes in so many different color options! It was hard for me to stray from my usual black, but there is an amazing tan color too and green…lots of choices and sizes! You need a luggage upgrade by now! Looks like a good sturdy luggage Christine! I’m pretty skeptical for check-in luggages with zippers tbh because they can be break open easily with pen knife. With that said, I will still consider this for a hand carry luggage cuz it looks good! It is a really sturdy piece of luggage Aldora, and if you take a look at their website, they even drop a bowling ball on it to test how much it can handle, and it doesn’t even make a dent! I saw this luggage 3-4 months ago and thought of it. I actually have had it opened on my browser for the last 2 months and haven’t browsed through it. lol I should probably just bookmark it. I love that you can charge your phone with it. It’s very handy for me since I travel a lot. It would be better than bringing a battery pack around. Sounds like a great travel piece. Great review! Yes Miki, you do travel a lot and it is such a sleek and modern suitcase I can totally see you rolling around with this set. Definitely take a look and let me know what you think! I need this luggage, it looks amazing! I will definitely check out their website. Yes definitely check this luggage out, all of their sizes are great and so are their colors! Ok you’re post is making my wanderlust soooo bad right now!! And can I have your legs?? But yes on a serious note, having a luggage that has double-wheel spinner wheels makes the hugest difference when you’re traveling and lacking sleep and energy. I’ll definitely look into this for future travels!! Hi Sangyay! Yes, you need this luggage for traveling. It’ll be worth it and it’s so affordable! I want this suitcase! That is so cool! I also love that your outfits are so stylish yet so minimalist like you said! I hope one day I can travel like you babe! Thanks Linh! It is a really amazing luggage and I love how modern it is. Great post, thanks for sharing 🙂 this travel post is so beautiful! Thank you Camille, I appreciate it! I want one of those. I love it. So cool and I can’t stop admiring those heels. Yes Sophie check the luggage out, it is definitely something everyone should have for traveling! The heels are from Senso from Revolve.com (FYI). Never heard of luggage with USB ports! It’s always annoying having to wait until someone else gets done with the wall jacks at the airport. I need to check these out! Totally right?! 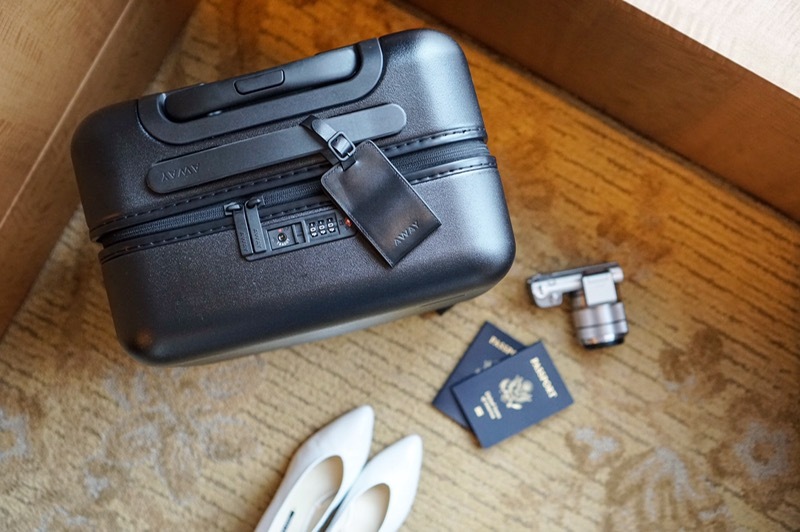 Yes this luggage is high tech and sleek so every blogger needs one! Andreea, yes you need to get one especially if you travel and even for quick getaways. The carry-on is a perfect size for weekend trips! Thanks for sharing this babe! I’m looking for a new suitcase and this just may be the answer! Yes, take a look at their website as they have so many sizes and color options! You will definitely find something you will love! I’ve been waiting to hear about this travel gear! I want some!! Hi Molly! 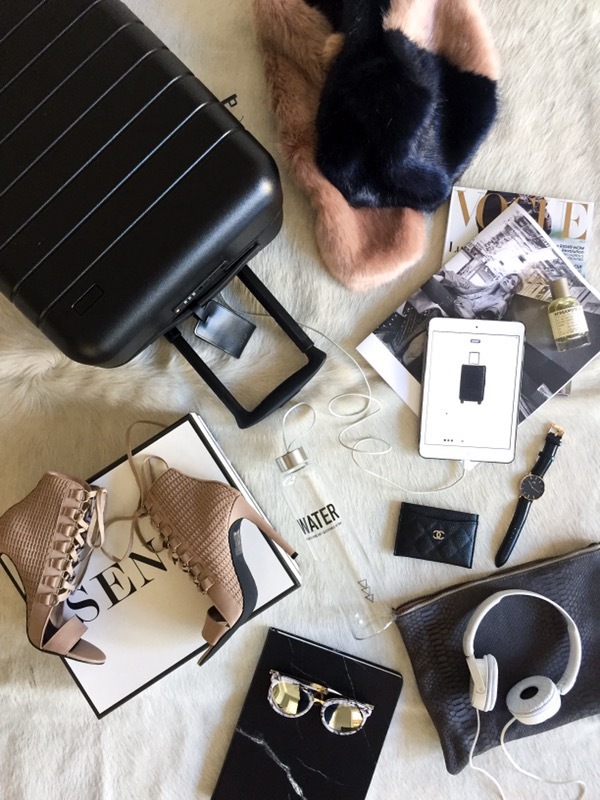 Yes, this luggage is a blogger’s dream. Check them out! Thank you Maryam you are so sweet! Have a great Monday! Yes you go on weekend getaways a lot Sharon so this is the perfect luggage for you! Definitely check them out! Isn’t it the best Jessi?! You totally need this whole set because you travel SOOO much! Have fun on your travels! 🙂 You packed wisely for a pretty tiny suitcase. Haha I need to learn your ways.. since I always end up overpacking whenever I go traveling. I try to be efficient although this suitcase fits a lot more than you would think it would! This luggage sounds like a total must have!! How do you look so chic even while traveling?! Hi Amy! Yes it definitely is a must-have and there are so many choices available – check them out! Wait a built in charger? That sounds amazing 🙂 I definitely want to look into this company now! Yes, totally! Isn’t that ingenious?! Charging ports? I’m sold! Thank you for sharing! Yes, it’s the best! Thanks Jasmine! Thanks Cece. This is the perfect luggage set! Thank you Gina! You definitely have to get one! Thanks Michelle! Yes, luggage like this is wonderful to have and you really don’t need to invest in another one again! Can’t wait to meet you too! Away is literally one of my favorite luggage brands right now, need this! Thank you Eric, and you are right, the modern and sleek design makes this luggage so wonderful and popular! Thank you Susanne! It really is a fantastic piece of luggage and the usb charger is the best! I use this carry-on all the time! This luggage looks awesome! I tend to over pack for most trips but it can be so refreshing to pack just what you need or know you will wear! Love the items inside your suitcase as well 😉 so cute! Thank you so much Lauren! I used to overpack for trips but I really end up not wearing half of it and have learned to just pack the necessities and basics and dress them up with jackets and accessories! Thank you babe! This is the coolest luggage out there! What an awesome post! I was literally just looking at hardshell suitcases last night since I need a bigger one for my upcoming trip to Asia (for all the shopping obviously). This is an awesome find, thanks for sharing! Thanks Jasmine, yes you totally have to look into this. I am trying to see if I can get a discount code since I’ve received so many positive response to this luggage so I will let you know if I do get one! Wow Christine! I love how you have styled these shots firstly! And secondly I admire your ability to pack lightly and efficiently. I seriously struggle with the efficient part haha. Thanks Sydney, this luggage actually holds a lot more than it looks like it does! This is awesome Christine! 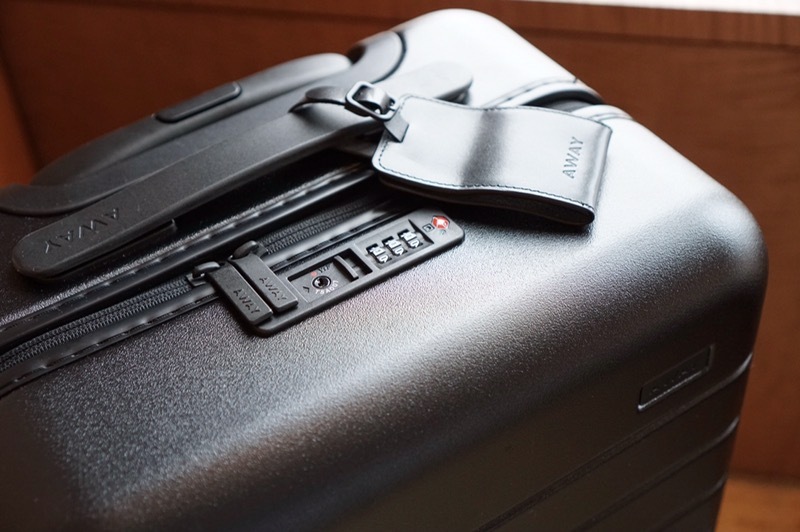 Thanks for sharing – good luggage is always key when traveling. My favorite part is the built in lock! So cool!! Hi Samira, yes the built in lock and the charger definitely come in handy! Thank you Katrina! This luggage is seriously the best out there and I love how modern it is. So cute! We are all about minimalism for traveling days! That’s such a smart looking luggage! Thanks for letting us know! It is seriously the best piece of luggage I’ve seen and had. I wish I could pack as light as you pack. It’s always a big challenge for me to close my suitcase ! It truly is a great piece of luggage! I am definitely not a minimal packer but it is definitely something I need to be better about. I must stop packing my whole life lol. Love the suitcase, it’s super chic!